THIS RECIPE HAS BEEN UPDATED!! Click here to see the updated version of the recipe. ... I've been on this weird kick of trying to make different breakfast foods using quinoa. First pancakes, now muffins. I have to say, after making Gordon Ramsay's uber healthy blueberry muffins, I think I kinda like these better. It could just be that I am not a huge fan of banana, which GR's version has. But these muffins are light and fresh tasting, and frankly, don't taste so.....healthy! But these muffins are just as healthy, if not healthier. There is no butter or oil. Very little sugar. Quinoa is incredibly healthy and packed with protein. I have found that quinoa, after it's cooked, can be used almost interchangeably with flour or oats. So don't be surprised if you find me making more recipes with quinoa! 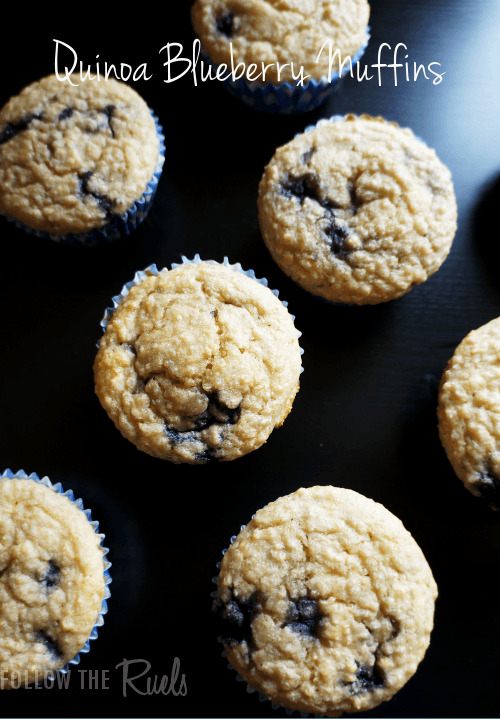 I hope you give these muffins a try! Preheat over to 400 degrees and line a muffin tin with liners, then set aside. In a large bowl, mix together quinoa, whole wheat flour, sugar, baking powder, salt, and lemon zest. Mix together the milk, yogurt, apple sauce, and egg in a small bow or measuring cup, then add to dry ingredients. Fold in blueberries. Spoon batter into prepared muffin tins. Bake for 20-25 minutes.